How I got this book: I am the proud owner of all these pretties! Goodreads summary of The Demon King: "Times are hard in the mountain city of Fellsmarch. Reformed thief Han Alister will do almost anything to eke out a living for for his family. The only thing of value he has is something he can't sell - the thick silver cuffs he's worn since birth. They're clearly magicked - as he grows, they grow, and he's never been able to get them off. One day Han and his clan friend, Dancer, confront three young wizards setting fire to the sacred mountain of Hanalea. Han takes an amulet from Micah Bayar, son of the High Wizard, to keep him from using it against them. Soon Han learns that the amulet has an evil history - it once belonged to the Demon King, the wizard who nearly destroyed the world a millennium ago. With a magical piece that powerful at stake, Han knows that the Bayars will stop at nothing to get it back. Meanwhile, Raisa ana’Marianna, princess heir of the Fells, has her own battles to fight. She’s just returning to court after three years of freedom in the mountains - riding, hunting, and working the famous clan markets. Raisa wants to be more than an ornament in a glittering cage. She aspires to be like Hanalea - the legendary warrior queen who killed the Demon King and saved the world. But her mother has other plans for her - including marriage to a suitor who goes against everything the queendom stands for. The Seven Realms tremble when the lives of Han and Raisa collide, fanning the flames of the smoldering war between clans and wizards." You may have noticed my enthusiasm for this series before, as I've reviewed The Demon King right here and The Exiled Queen and The Gray Wolf Throne on my own blog. It's been a little over a year since I first got around to starting this series and I've been kicking myself ever since for not doing so sooner! Or maybe it was for the best, as the wait for The Crimson Crown has been KILLING me ever since I finished The Gray Wolf Throne. The Seven Realms series reminds me why I love epic fantasy so much and how nothing beats losing yourself in a magical world full of high stakes battles, heroes, heroines and just all of those good things. I love the dual perspective we have through Han and Raisa, characters who are so very different but both so incredibly strong and loveable! Han is the lowborn streetlord who needs all of his wits to bust himself out of whatever trouble he's landed himself into and Raisa the princess of the realm who needs to grow up a little too fast and come into her own in order to keep the kingdom from falling apart. I have loved watching these two grow and shine, crying and laughing and loving right along with them! I love how determined they both are, how they are both smart and eager to learn and are just such well rounded characters I wouldn't be surprised if I ran into them on the street. Well, minus the being from a different realm and all that. And if my word alone doesn't quite cut it, our very own Kimberly is another fan of the series and I can't wait to discuss EVERYTHING that happened in The Crimson Crown with her after I finish it. Also, my boyfriend who doesn't really read much is anxiously tracking my progress cause he wants to read it REALLY BAD as well! This story is one that I will carry with me in my heart. 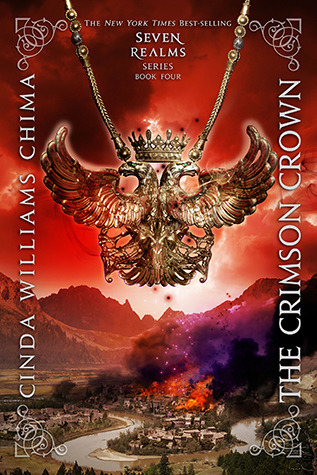 Cinda Williams Chima has made me a total fangirl with her amazing writing and fantastic worldbuilding! She's created a whole set of characters for me to love and root for and I personally feel that this is YA fantasy at its finest: it doesn't get much better than this. Seriously. There's epic battles, losses, characters coming into their own, court intrigue, a world filled with magic and a lovestory all in one and I just want to make you all sit down and READ it! Now excuse me while I go off to read The Crimson Crown, you'll be seeing my no doubt equally gushing review of it soon! Everyone raves about this author and I have yet to read her! I need to read more fantasy! You need to read these books! I LOVE fantasy and every time I read a fantasy book I wonder why I don't read more of them, because they're usually my favourite reads. I'm looking for the Broke and Bookish Secret Santa post so I can sign up for this year. Is it posted? It is! Did you find it yet?